The carrots go by many different names, but the main idea is that they’re quite colorful. I have now tried two different kinds, Carnival and Rainbow. 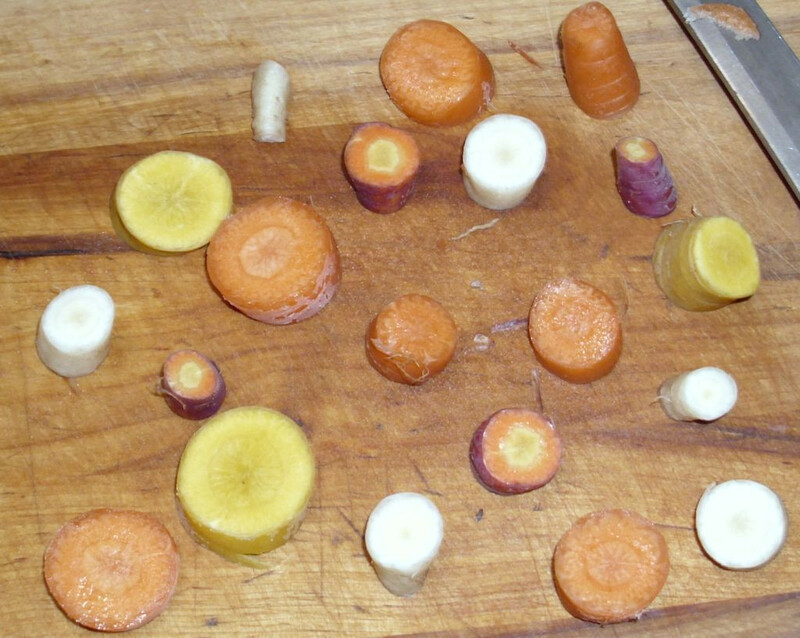 Both kinds produced yellow, orange, red, and purple carrots. The Carnival variety pictured below also produced white and, oddly enough, one green carrot. I’m pretty sure the green carrot was due to some oddity in the seeds (or possibly it was introduced to sunlight in some manner). They both produced tasty carrots where the color definitely affected carrot taste. Of the two packages, I obtained the largest carrots from the Rainbow packet, but a single season doesn’t truly provide enough testing time to say that this would always be the case. I may simply have had an exceptional year. I plan to buy one packet of each sometime and plant them in the same area of the garden in the same year so I can perform side-by-side comparisons. The carrots weren’t just colored on the outside. Cutting the carrots showed that the white, yellow, and orange carrots were the same color all the way through. The red carrots were red on the outside and orange in the inside. The purple carrots proved the most interesting, with bands of purple, orange, and yellow. Eating the carrots raw proved to be a real joy because you got different flavors with each bite and adding a dip (such as ranch or blue cheese dressing) simply added to the variety. Cooking the carrots will change the color of the red and purple carrots to a dark orange. 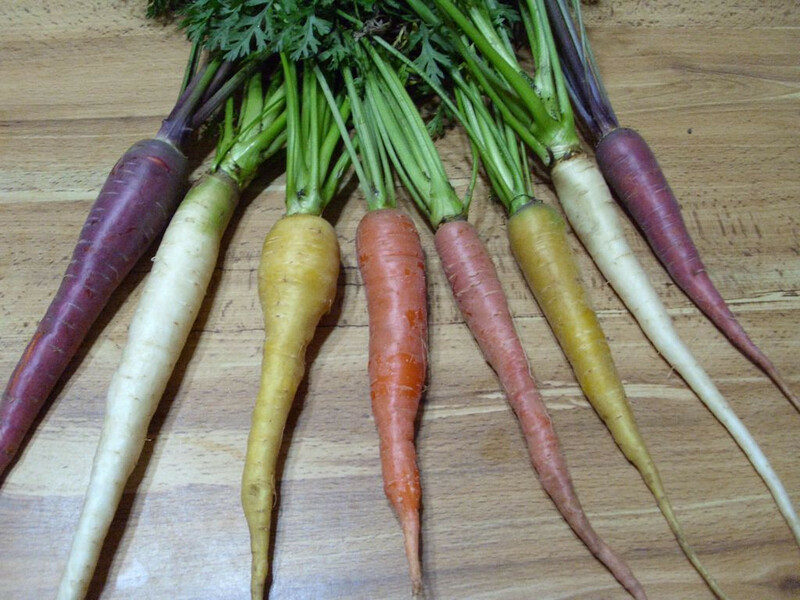 The white carrots do take on an orange cast, but you can still tell they were originally white. 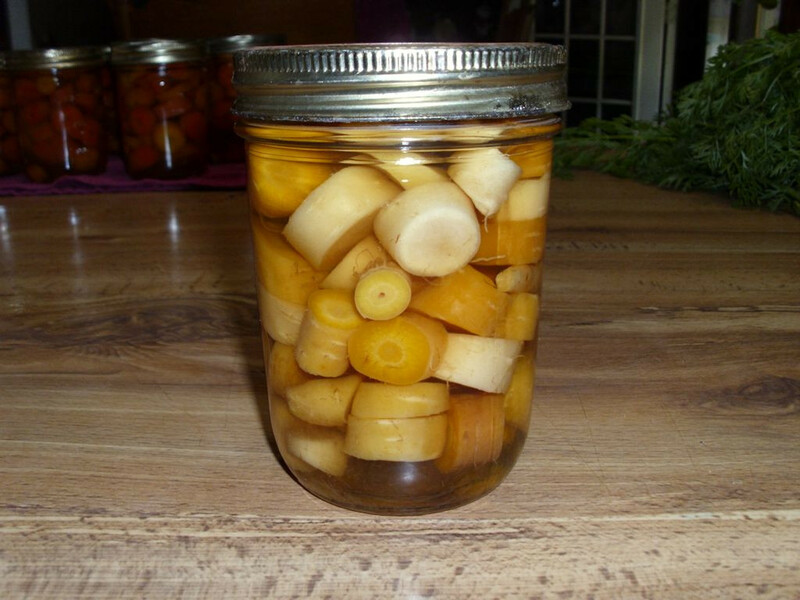 The same holds for the yellow carrots—they grow a bit more orange, but are most definitely remain lighter than the orange carrots. Therefore, even when cooked, you end up with a colorful meal, but not quite as colorful as the raw carrots. The colorful carrots even can well. The taste differences between carrots tends to fade a little when cooked and even more when canned. I can still tell the difference between these carrots when canned and other, pure orange, carrots. Unlike many multi-colored vegetable choices, getting multi-color carrots will provide you with enjoyment throughout the year. I now have some colorful choices for a variety of uses this winter. Let me know your thoughts about colorful vegetable choices at John@JohnMuellerBooks.com. 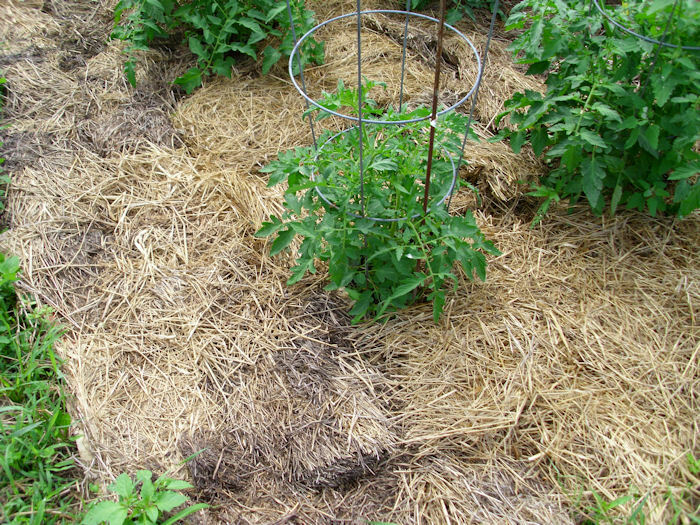 There are many theories on the proper technique for mulching. This post doesn’t compare them because the bottom line is that any sort of mulching is better than none at all. If you find a technique that works for you, by all means, use it. My technique works well for me because I can get the materials at a very low cost. Our mulching begins by laying down two sheets of non-advertisement newspaper. There are some things you should consider about the newspaper you use. First, make sure the newsprint is printed with soy or a similar non-toxic ink. Second, never use the glossy advertisements. Even if they aren’t printed with toxic chemicals (they often are), the glossy paper tends to repel water and takes a very long time to break down. Third, make sure the paper is large enough to overlap. Make sure the newspaper does overlap by about an inch or so as you lay it down. Otherwise, the weeds will immediately spring up through any gaps. In the past, we’ve doused the newspaper in water before laying it down, but it works just as well dry as long as it isn’t windy. Lay hay or dried grass on top of the newspaper. Make sure the grass is absolutely dry–brown is best. If you want to use this second technique, let your grass get a little long, let the newly mown grass dry a day or two, use a rake to move it about, and then let it dry for several more days before you rake it up to use it as mulch. We allow a full 2-inches of grass or hay on top of the newspaper. Here’s what our small garden looks like with mulch in place. My uncle supplied us with some square bails of hay. They work quite nicely for mulch. The hay had been rained on, which ruined it for animal fodder. You may be able to find a farmer in your area who has some ruined or third cutting hay that you can buy for a pittance. Notice how the hay covers very square inch of the garden. The newspaper and hay end in a small circle around the base of the plant. If the mulch touches the plant, it will cause the stem to rot and you’ll lose the plant. Rebecca and I didn’t know about this little problem during our first few years and we lost quite a few plants to mildew or rot. The small spacing we allowed still provides all of the benefits of mulching. Tomatoes are especially prone to black spots. When it rains, the rain hits the soil, picks up pathogens, and splashes these pathogens onto the tomatoes. The mulch keeps the rain from splashing. The tomatoes can still get spotted from other sources, but it’s less likely. As I mentioned previously, some vegetables don’t lend themselves to mulching very easily. For example, both carrots and beets are planted so closely as to make it impossible to mulch between the plants. You can mulch around the area in which the carrots and beets are growing though. Potatoes are planted further apart, so they mulch just fine. In fact, unless you plan to take time to hill your potatoes, mulching them is essential to prevent the potatoes from turning green (we don’t hill our potatoes—it’s much easier to lift the mulch and the end of the season and almost pick them up off the surface). Some mulching depends on the season. 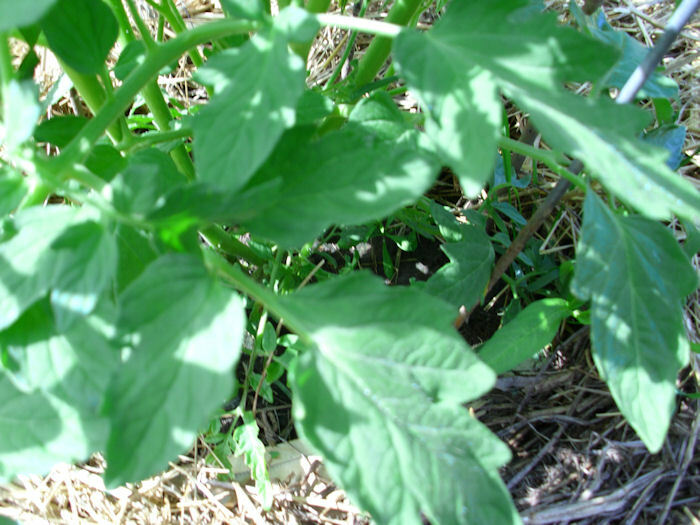 For example, bush green beans mulch fine during a hot and dry summer. They’re prone to mildew during a cool, wet summer. You need to allow a little more distance between the mulch and the bush green beans (or any other bush-style bean for that matter) to allow air flow. Pole green beans and peas don’t require this spacing because the majority of the plant is on a pole or a fence. There are a lot of interesting ways to mulch a garden. For example, some people use cardboard for the task, while others use bark. The chocolate smell of cocoa hulls is quite enticing (assuming you can afford the high cost). Some materials provide properties that our hay mulching technique doesn’t provide. However, you have to be careful in choosing a material because some materials, such as bark, will actually leach important nutrients out of the soil (using bark can leach all of the nitrogen and also make the soil acidic). We actually do use bark for our blueberries and grapes because they require an acid soil, but we never use bark in the garden. Let me know your thoughts on mulching at John@JohnMuellerBooks.com.